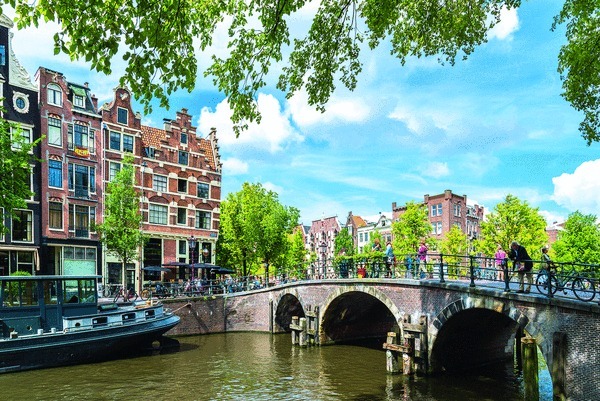 This cruise spans 2,000 kilometers across Europe, from Budapest, the so-called “Queen of the Danube” to Amsterdam at the North Sea. 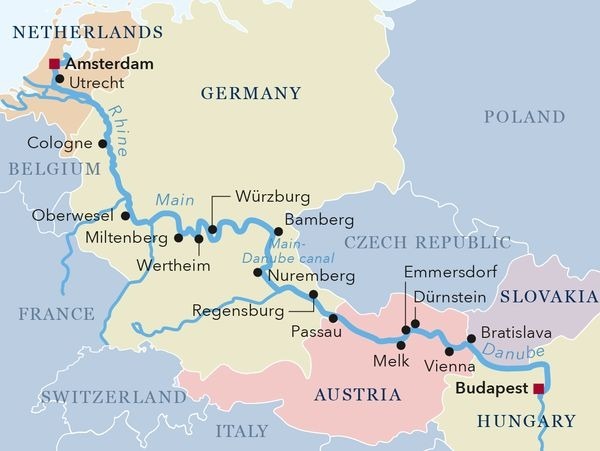 Highlights of the cruise include the passage through the Rhine-Main-Danube canal, visits to numerous capital cities, unique landscapes such as the myth-enshrouded Lorelei rock, the “Schlögener Schlinge” below Passau, the picturesque Wachau region, and the Danube-knee at Visegrad (the Hungarian Wachau). 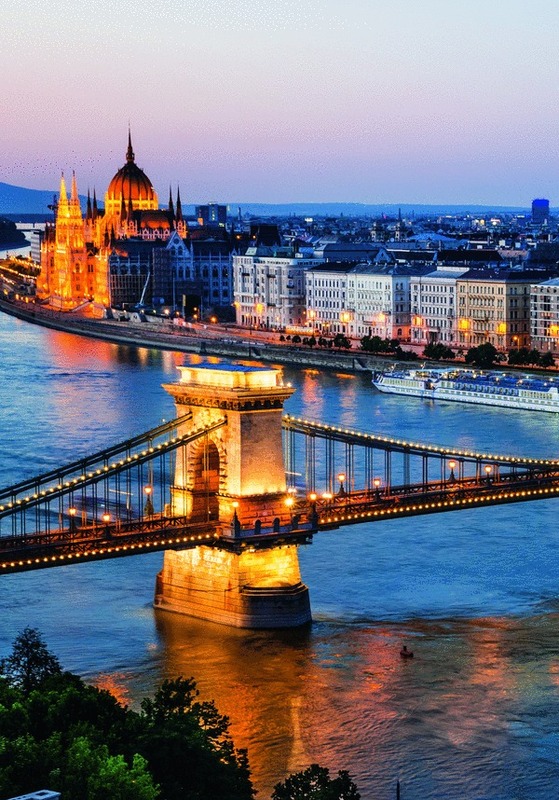 Spend a full day exploring Budapest, the capital city of Hungary. 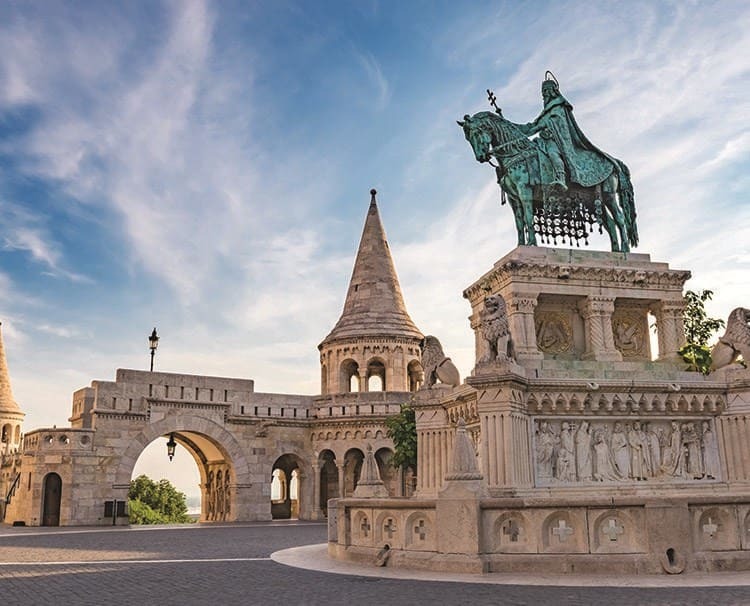 A large portion of this city is a World Heritage Site, including the banks of the Danube, Andrassy Avenue, the Buda Castle quarter, Heroes’ Square, and the Millennium Underground Railway. With 80 geothermal hot springs, the third largest Parliament building in the world, and the second largest Synagogue, there is truly something for everyone to enjoy in this bustling metropolis. This evening, a Hungarian folklore show and evening cruise through the “Paris of the East” on your Amadeus Vessel is a perfect start to the cruise. Walk through the restored old town, from Michael’s Gate, where you can admire the Primatial Palace and St. Martin’s Cathedral, a former coronation cathedral for Hungarian kings, to the Academia Istropolitana, the oldest university in the city, which dates back to the 15th century. Back onboard, enjoy a delicious dinner with your fellow travelers. There is much to see and explore in the impressive Imperial Vienna. Drive along the Ringstrasse, visit one of the many museums, or visit the Naschmarkt for a sample of culinary delights, the city is yours. 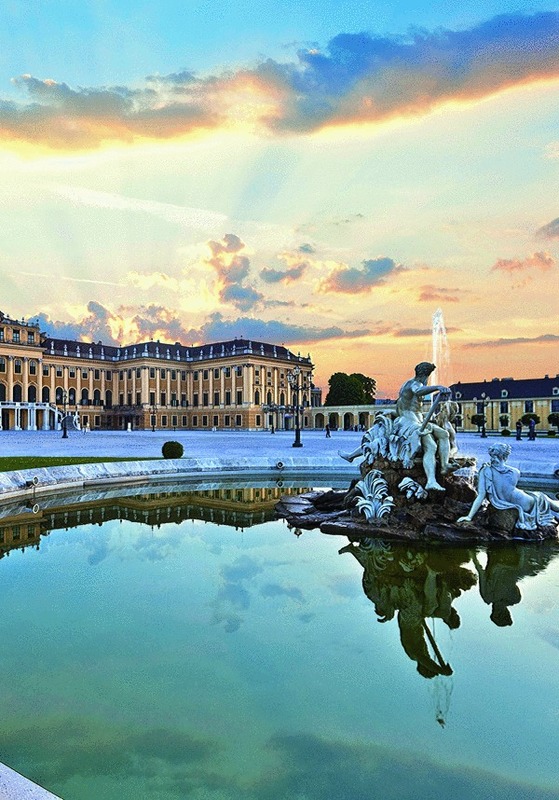 An excursion to Schönbrunn Palace, the former Habsburg summer residence of Empress Maria Theresia is offered this afternoon, as well as an evening concert ‘Sound of Vienna’ at a local music hall to round out your stay. Awake in the village of Dürnstein, known as the “Pearl of the Wachau”. Spend the morning in the romantic village with its iconic blue church and winding streets, and perhaps sample the local wines. After lunch onboard, dock in Emmersdorf, in the heart of the UNESCO-protected landscape, of the Wachau Valley. 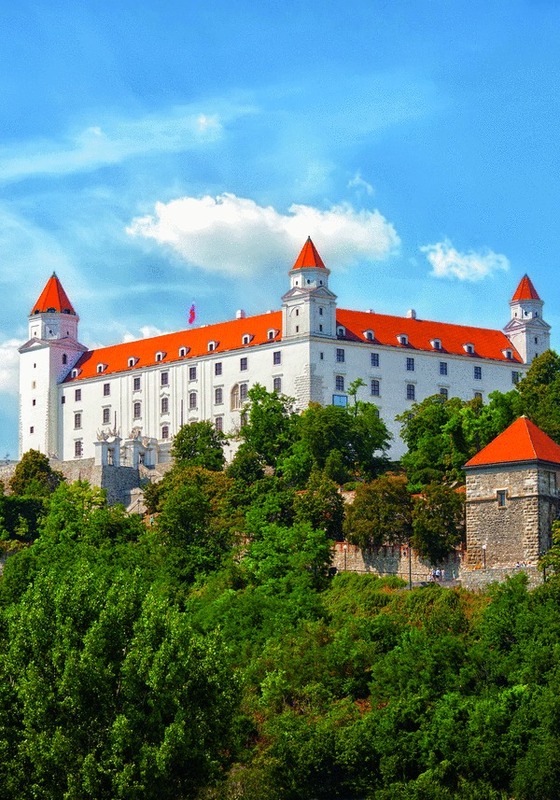 Spend the afternoon discovering this typical small town in Lower Austria or travel across the river to nearby Melk and its magnificent Benedictine abbey, the largest in Austria and a seat of higher education. Our next port of call is the three-rivers city of Passau, located at the confluence of the Danube, the Inn and the Ilz rivers. High above the rivers, the Veste Oberhaus 13th century fortress houses a city museum and observation tower. 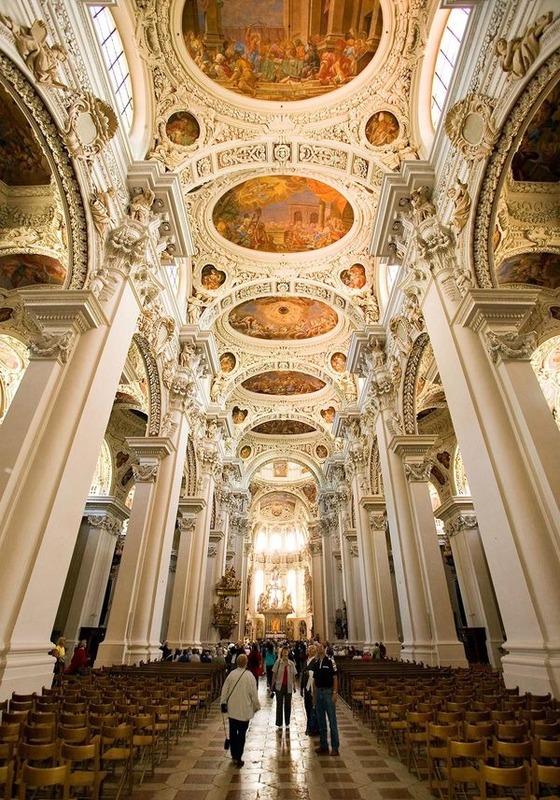 The old town of Passau is filled with outstanding Baroque architecture, including St Stephen’s Cathedral containing the largest pipe organ in the world with 17,974 pipes. This evening enjoy the Captain’s Gala Dinner as you continue to beautiful Regensburg. 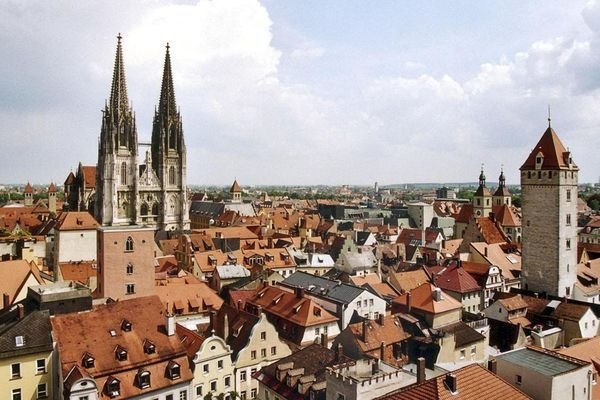 Visit the beautiful city of Regensburg one of Germany’s most well preserved medieval cities. 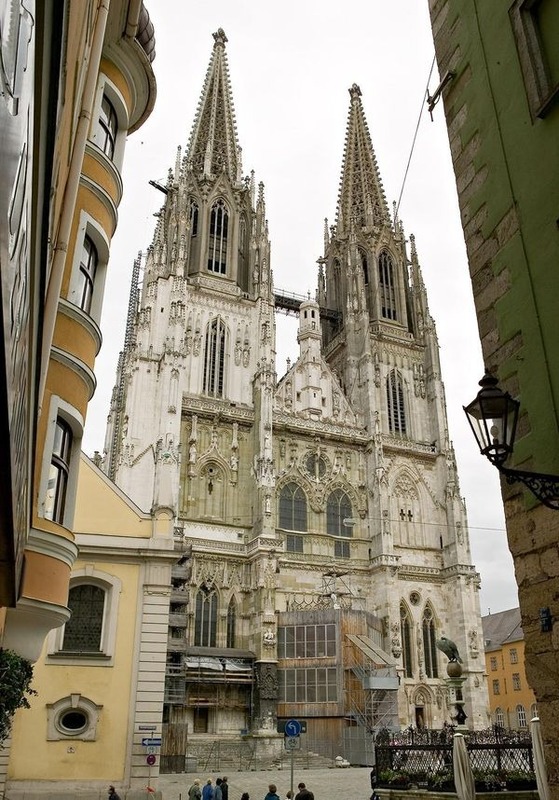 Among its architectural treasures are churches, monasteries, the town hall, and one of Europe’s oldest bridges, which has spanned the Danube since the 12th century. Explore the city and feel the former power and wealth which once controlled the trade route to the Orient. 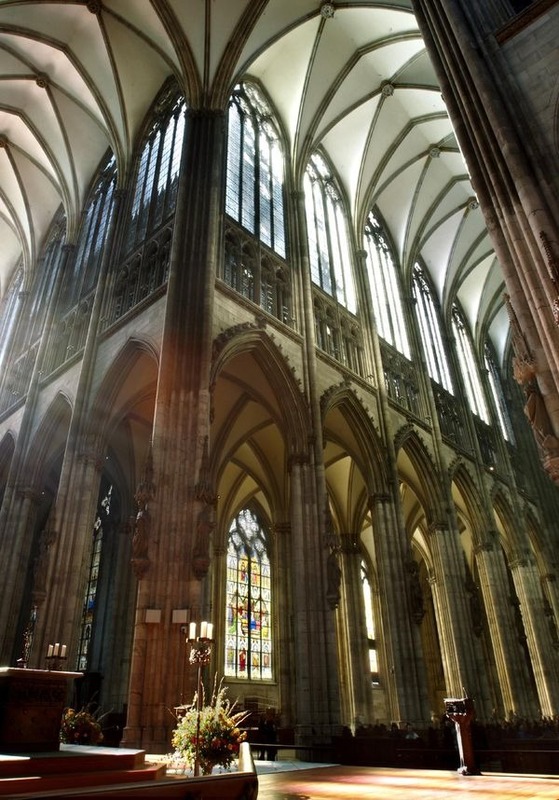 Step inside the Regensburg Cathedral, dedicated to St. Peter, and admire this masterpiece of Gothic architecture in southern Germany. Spend the afternoon cruising the waterways of the Danube. A Bavarian theme surrounds the evening with a special menu and festivities. Following breakfast, enjoy your day in Nuremberg. 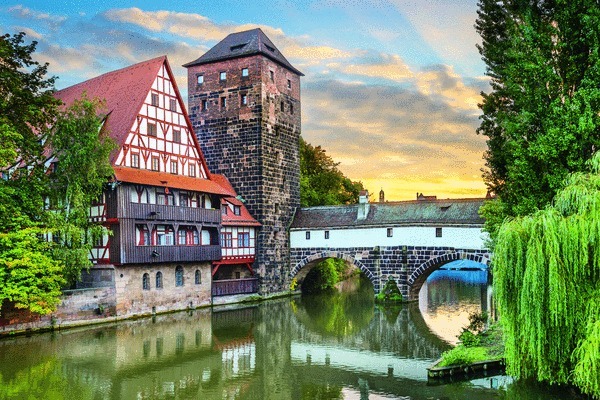 Consider a visit to the romantic Old Town of Nuremberg, lovingly restored after the destruction incurred during World War II. A hub for history, Nuremberg is home to many museums including the Documentation Center, which recounts the effects of the Nazi Regime and World War II on the city and surrounding areas. Back on board, it’s full steam ahead. Sail Bamberg is a perfect place to begin your exploration, the Imperial city of Bamberg. This medieval town is a UNESCCO World Heritage site, is home to This UNESCO n to the UNESCO World Cultural Heritage site, the Imperial city of Bamberg. This medieval town retains its medieval layout of three settlement areas, and Baroque facades. As you take in the seven hills of Bamberg, each topped with a stunning church, enjoy a beer from one of the many local breweries. Relax onboard this afternoon while cruising the Main River. This evening enjoy a talk about the creation and importance of the Rhine-Main-Danube canal. Today, visit Würzburg, a city in Bavaria known for lavish baroque and rococo architecture, located in the center of the Franconian wine country. 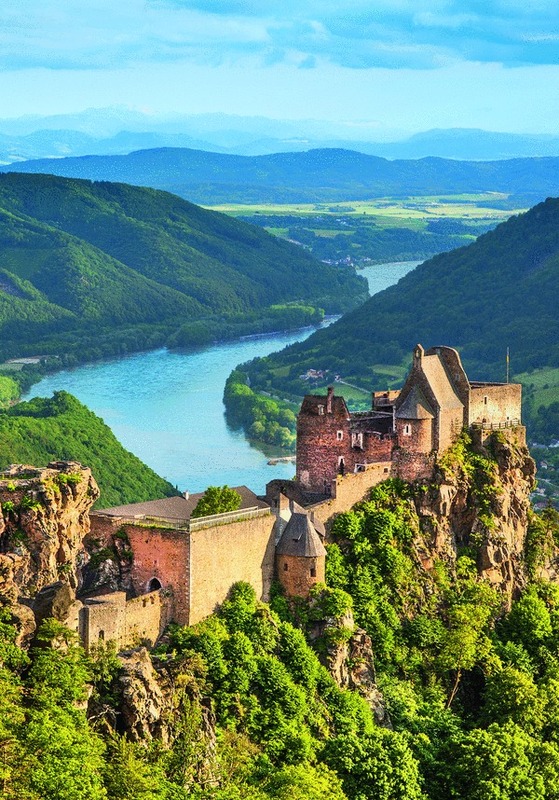 Experience the many beautiful sights of the town such as the marketplace, the Maria Chapel and the old main bridge, the Marienberg Fortress and the surrounding vineyards. 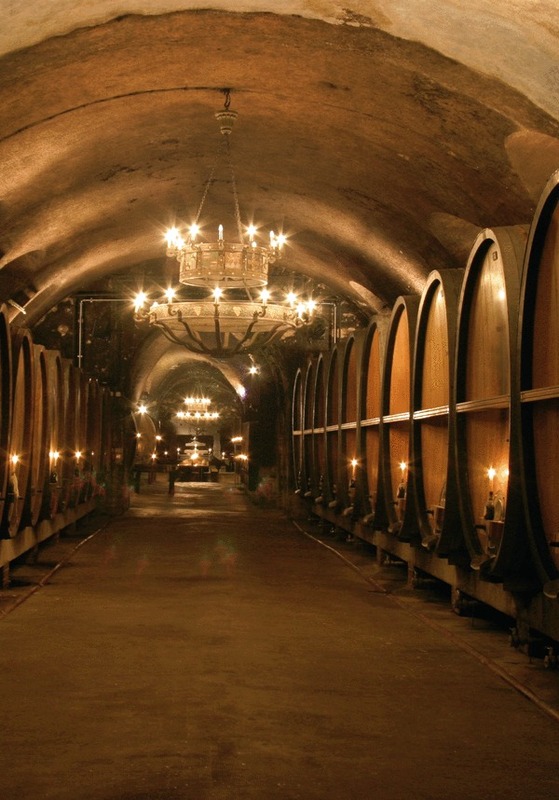 As the central hub for wineries in this part of Germany, Würzburg is the perfect place to visit some of the local wineries for tastings. From Würzburg, you can venture to nearby Rothenburg ob der Tauber, one of the most perfectly preserved medieval towns in Europe. Its towers, city gates, walls, and half-timbered gables have remained unchanged since the Thirty Years’ War. Return to the ship and continue down the river Main. Two historic cities on the river Main are on the agenda for today or enjoy a day of cruising. In Wertheim, explore the medieval streets with its half-timbered houses and glass museum, all watched over by the two-clock tower on the hill. 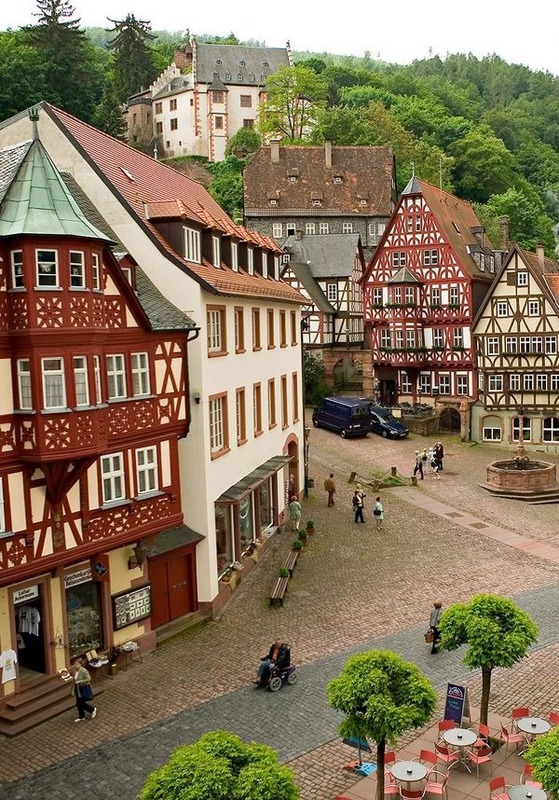 Continue to Miltenberg, a city flanked by the river Main and an incredible forested hillside. In this unique town, see one of the oldest inns in Germany, the Hotel “Zum Reisen” and the Miltenburg Castle. This is another wonderful opportunity to sample some of the region’s red wines. After a relaxing afternoon cruising, join your fellow travellers for a beautifully prepared dinner. Today we visit the “Town of Towers,” so named because of the 16 towers still standing along the original city wall surrounding the town. 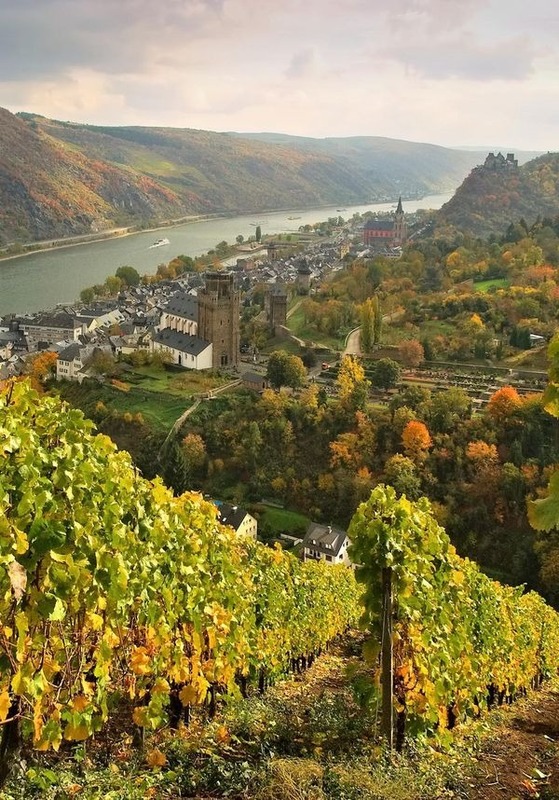 Oberwesel is home to two Gothic churches located on opposite ends of town – both worth a visit. In the shadow of the Schönburg Castle, enjoy a glass of the city’s famous Riesling wine as you take in the beautiful views. Back onboard this afternoon, cruise through the scenic passage of the Loreley. Awake in Cologne, the fourth-largest city in Germany, with its skyline marked by the twin spires of the Cologne Cathedral among modern buildings. New blends with the old in this metropolis. After a morning in the city, you may want to visit nearby Siebengebirge National Park and Drachenfels rock. Germany’s first nature reserve, with the world-renowned Hotel Petersberg, is a great way to spend the afternoon. Tonight, is a special night on board, the Captain’s Gala Dinner. 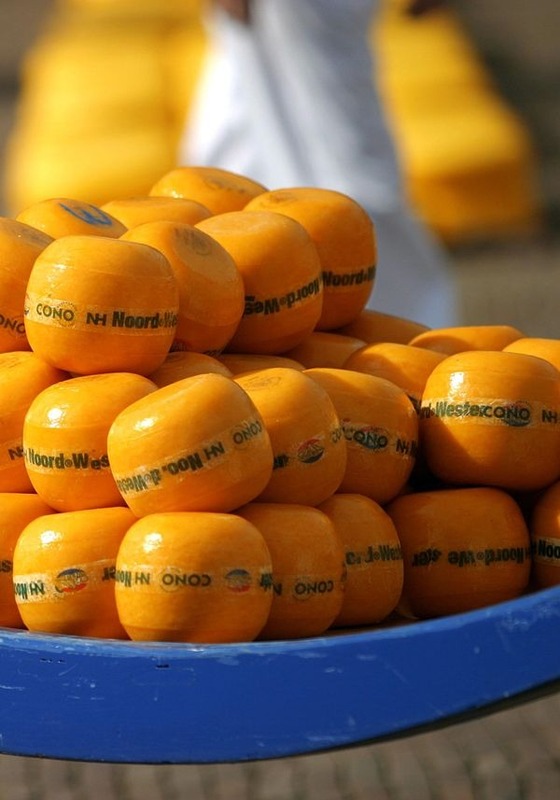 Spend the morning cruising the waterways of the Netherlands or take the opportunity to disembark in Utrecht and explore the countryside which includes a visit to a local factory to learn about Holland’s famous export – cheese. Rejoin the vessel in Amsterdam, the capital of the Netherlands. With a canal system as intricate and unique as Venice, this city is known for its 17th century architecture and many museums. Before returning to the ship this evening, be sure to catch a glimpse of the bridge lights reflecting off the canal water.